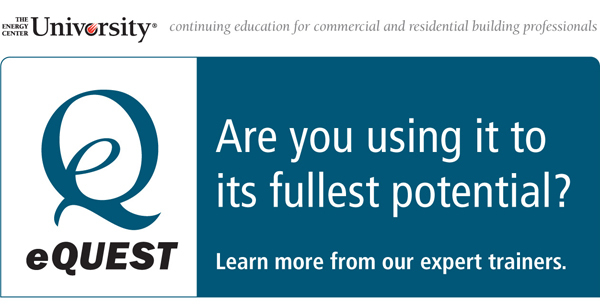 The Energy Center of Wisconsin has opened registration for another eQUEST training in Appleton, Wisconsin in April. There are also some spaces left for the training in suburban Chicago in March. See below for details. >From quickly evaluating building energy efficiency approaches early in design to the pursuit of LEED certification, eQUEST provides comprehensive building performance modeling and detailed analysis that can help in all phases of the design process. Attend all three days of training at a discounted rate or attend a portion of the series based on your eQUEST skill set and experience. Amanda Bogner, PE, BEMP, LEED AP BD+C, The Energy Studio, Inc.